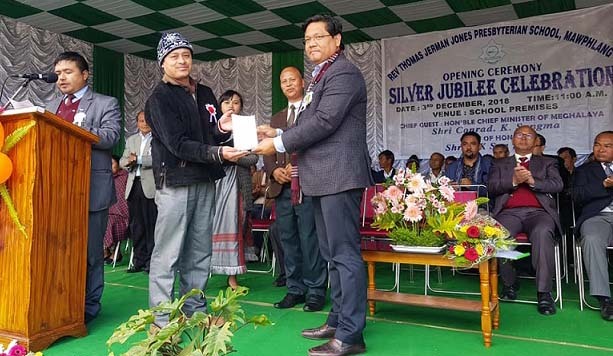 Meghalaya Chief Minister Conrad K. Sangma at the Silver Jubilee celebration of Rev Thomas Jerman Jones Presbyterian School in Mawphlang of East Khasi Hills. Meghalaya Chief Minister Conrad K Sangma on Monday said that there is a huge challenge in improving the overall education scenario of the State and the Government was making all effort to bring about a turn around. “Unless and until we don’t focus on quality education, we will not be able to take the State to its next level. The educational infrastructure is weak in our State and successive government has tried to address the challenge but it still prevails. We have made an attempt to accord priority to education sector to address the challenge,” Chief Minister Conrad Sangma said. Lauding the school authority for its initiative, he said that the vision of the school to provide students vocational education, training on traditional music and sports will go a long way in furthering the talents of the children. He also handed over mementos to the founding members of the Schools, senior teachers, who were present during the Silver Jubilee celebration in presence of local MLA SK Sun and other dignitaries.